Longmont, CO – – – As the heat continues this summer, it’s important to understand how much water your lawn actually needs, how much water you are applying and when is the best time to water. The Rocky Mountain Sod Growers are the experts in the field and want people to understand the water needs of turf so that water isn’t wasted. How much water are you actually applying? Verifying watering uniformity can be accomplished with a very simple and inexpensive method that uses only 4 to 6 flat-bottomed, straight-sided cans (gauges), a ruler and a watch. Run the sprinkler for a specific time (pop-up spray heads – 15 minutes, rotors- 30 minutes). Watering Guide – The amount of water shown illustrates the need for more water in the heat of the season and less during cooler periods. Apply 1/2″-3/4″ of water in 2 or 3 cycles to promote deeper infiltration and minimize run-off. 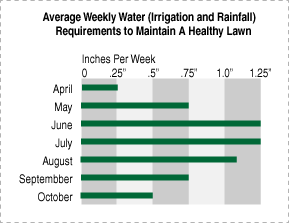 Adjust the amount of water throughout the growing season by how often the grass is irrigated. Check the lawn as stated above to see if it needs water. Postpone or skip watering if there has been sufficient rainfall.